If there's anything that can drive a mother to the edge of paranoia, it's hearing news of disease outbreaks that can lead to death. Yes, I am guilty of it. One of the most dreaded virus that I would never wish on anyone - it's Dengue Virus. Yes, I've seen some friends, their children & even my own sister suffer through it and how it has made them weak and helpless that I knew I have to actively take part in making sure that our home and community becomes Dengue-free. 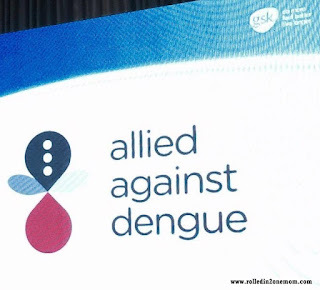 So when I was fortunate enough to be invited by Ms. Rowena Wendy Lim Lei to join GlaxoSmithKline Consumer Healthcare Philippines Inc. and other organizations at the recently held #AlliedAgainstDengue initiative launch - I was more than excited to attend. But before I go on any further, let me walk you through some of the important things Us Moms and everyone else needs to know about Dengue. Dengue fever is a virus infection caused by the Dengue virus. There are 4 kinds of Dengue viruses and these viruses are transmitted by the Aedis mosquito. If there's something that we need to realize, Dengue is becoming a rising health problem not just in the country but the whole world. Those that are most prone are usually tropical countries like the Philippines. These signs can be mistaken for a regular flu but you need to make sure that you have your child tested (free Dengue kits are provided in your local health centers) for Dengue virus before ruling out any disease. Just like any careful Mom, I don't need to stress it enough - DENGUE kills. We need to always be on guard and on the lookout for signa and symptoms. 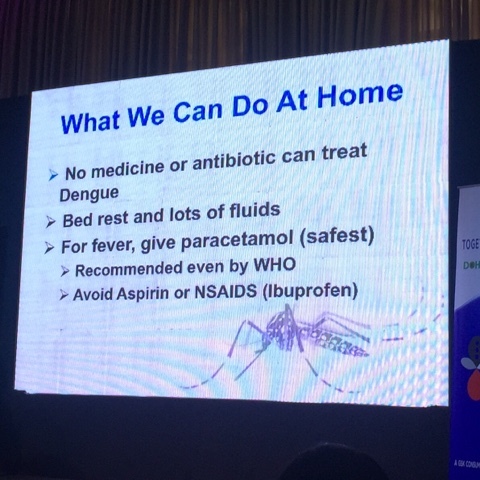 Keep in mind Mommies - no medicine or antibiotic can treat Dengue. Proper rest and lots of fluid intake can help make it comfortable for the patient. Always provide paracetamol as aspirins and NSAIDS can trigger bleeding. Bring your child to the doctor after 2 days of consistent fever. Yes, we have in our hands mommie, the power to protect our children from Dengue virus. There are things we can practice or do at home that will ensure that mosquitoes will somehow steer clear! Remove all potential breeding places of mosquito! A clean and well-lit home is a plus as these disease carrying mosquitoes like it in the dark! As I've mentioned in the beginning, GlaxoSmithKline Consumer Healthcare Philippines Inc. has decided to join forces with notable agencies in the country to start the fight against the alarming effects of Dengue Virus in the country. GlaxoSmithKline Consumer Healthcare Philippines Inc. said, "Dengue is rife in the Philippines and unless we join forces, the disease will become the fastest spreading health threat in the Philippines. GSK was motivated to initiate Allied Against Dengue as we were concerned of the escalating hazard and effects of dengue on the nation including our employees and their families who have experienced the dreaded disease. Uniting forces and actions enable greater empowerment across stakeholders, education delivery to communities nationwide and allow us to help people do more, feel better, and live longer. 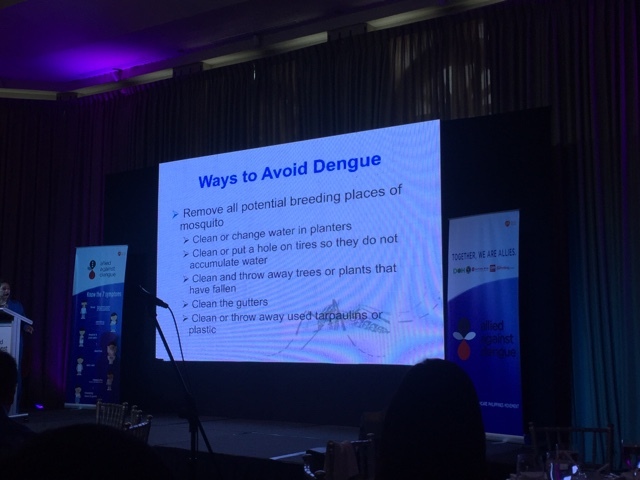 Allied Against Dengue is the catalyst to this with the ultimate goal to reduce the impact of dengue burden in Filipinos." 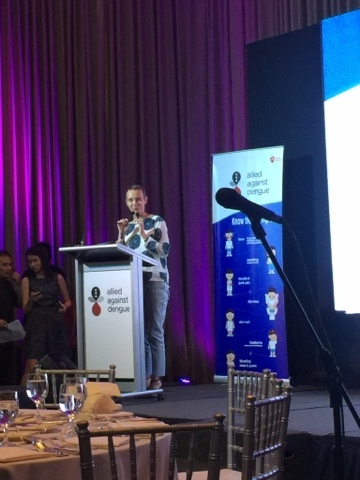 Ms. Heather Pelier of GlaxoSmithKline Consumer Healthcare Philippines Inc.
Allied Against Dengue is the movement that aims to lead change and create bigger impact to society through collaborative partnerships with the DOH, private institutions, healthcare providers, media influencers, and community leaders. 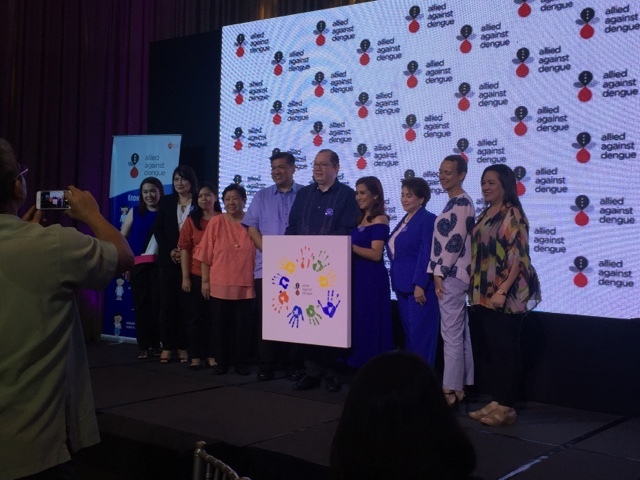 GlaxoSmithKline Consumer Healthcare Philippines Inc. together with the other coalition partners activate the ambitious roadmap that the movement has set out to achieve its goal of reducing the burden of dengue on society through empowerment and education. 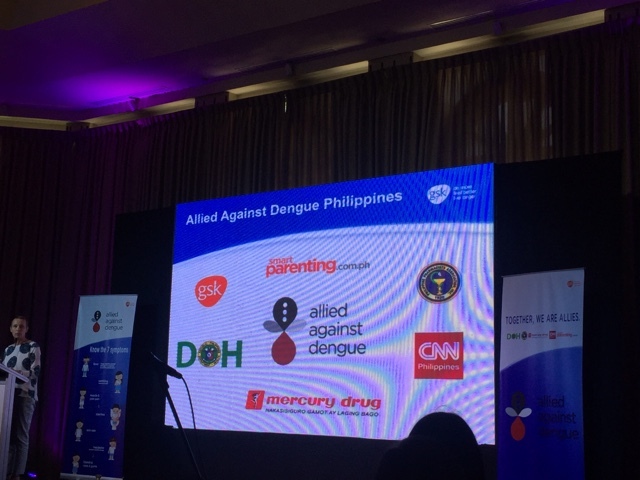 The roster of agencies that came together to form an alliance against the dangerous Dengue Virus. 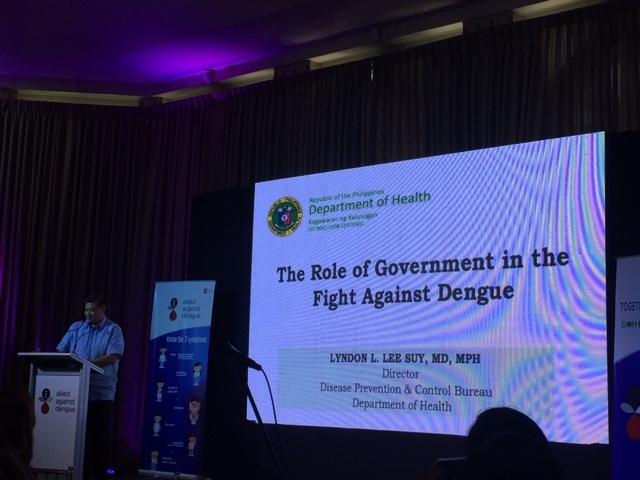 More than 1,200 pediatricians and pharmacists will be involved in the public education and awareness of Dengue fever management across Philippines. This is aligned to and complements the World Health Organization (WHO) global strategy for prevention and control and DOH's initiatives. Every alliance partner will leverage their core competencies and dedicate energy, funds and resources in the movement to help reduce the incidence rate of and deaths caused by Dengue fever. • Implementation of Continuous Pharmacy Education (CPE) program in identified chapters, targeting 200 pharmacists. • Education and recruitment of at least 1000 Allies Against Dengue through employee engagement, online and on ground activations. Sample of Dengue Primer from DOH. To achieve these milestones, Allied Against Dengue is set to roll out a series of initiatives including train the trainer programs, organized information centers through the coalition partners networks, community education activations, and employee volunteers who will be part of and drive the community outreach at dengue hot spots. For more info, visit GlaxoSmithKline Consumer Healthcare Philippines Inc. website! The force behind Allied Against Dengue. 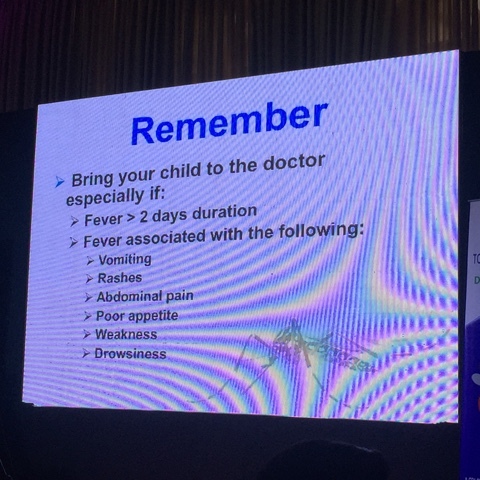 Yes, as mentioned, it is important to remember that when your child is hit by Dengue fever - it is a must to provide him with paracetamol instead of NSAIDS (ibuprofen) or aspirin as these triggers further bleeding. GlaxoSmithKline on the other hand offers Calpol - our number 1 ally against Dengue Fever Management. 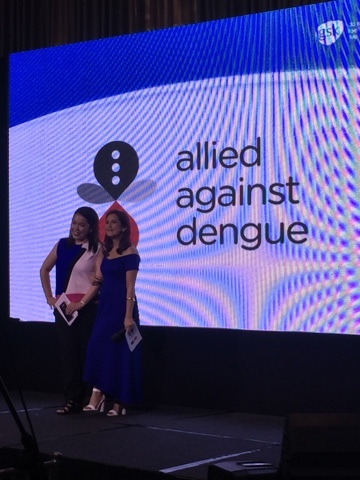 Two Certified Calpol Moms were present at the launch of the #AlliedAgainstDengue Movement to show their solidarity and shared some helpful tips too. 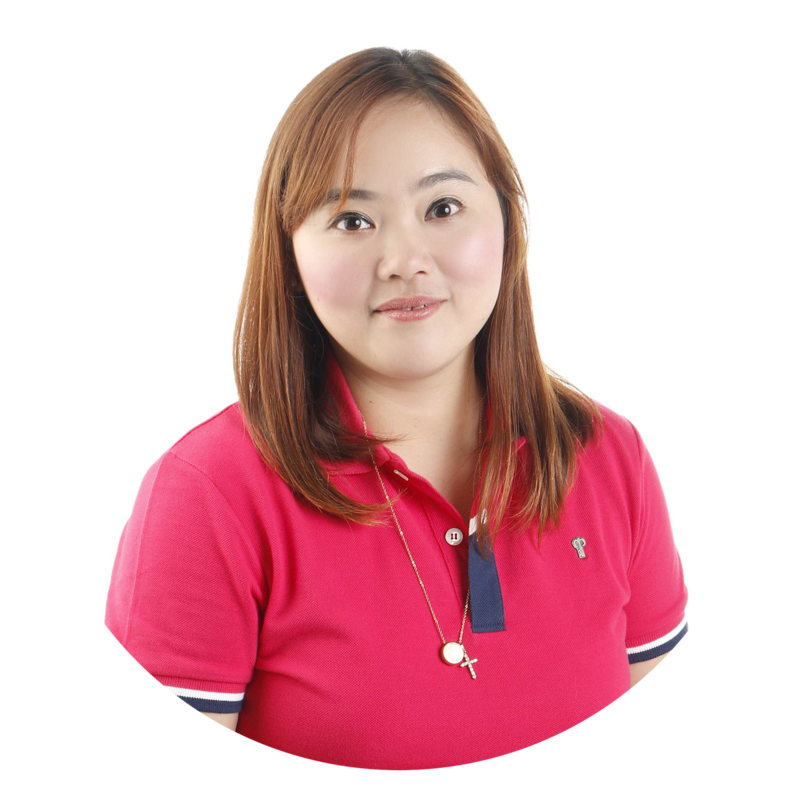 I am talking about Ms. Rowena Wendy Lim Lei - a mother and a blogger (Animetrics World) and of course, Ms. Jolina Magdangal- Escueta - actress, TV Host and a proud Mom to her son Pele. Ms. Rowena Lim Lei and Mrs. Jolina Magdangal - Escueta - Calpol Moms. Both Moms stand by their belief that Calpol (paracetamol) is suitable for managing Dengue fever. Why? • Based on WHO Pocket book of Hospital care for children (2013) Paracetamol base is the 1st line treatment recommended by WHO for children more than 2 months with fever. • Drops and suspensions come with easy-to-use measuring cup for accurate dosing of children. • Comes in kid-friendly flavours - orange for 0-2 year old drops, orange and strawberry for suspensions. Now who wouldn't trust Calpol? 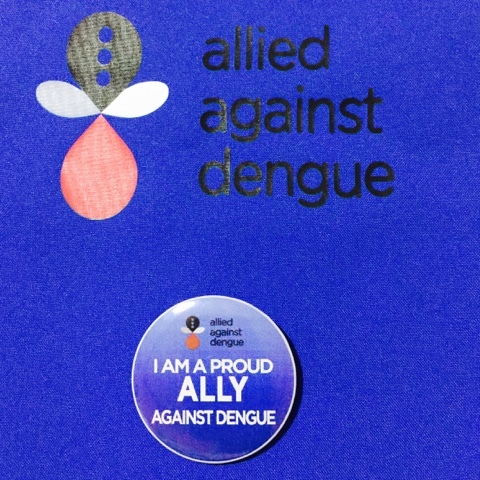 As head of the Health and Sanitation Committee in our community, I am one of those who is 100% behind the #AlliedAgainstDengue movement of GlaxoSmithKline. We held a series of Dengue Virus Education Classes in some parts of our barangay, Larviciding and misting especially around the hot spots. I am part of this advocate that's why I am glad to have been invited to be part of this momentous event. I am one of those who hope that one day, Dengue will not be a primary cause of Death in the country. And yes, I am also a Calpol Mom and a proud Ally Against Dengue. For more info about the movement and the force behind #AlliedAgainstDengue - do visit GlaxoSmithKline's website. Dengue is really scary esp to children! Someone in the family had it before and she was I think 7 or 8 years old and I didn't know how serious it was then! It really is best to educate how serious Dengue is to everyone, most esp to kids. I think I've used Calpol once though my pedia always prescribed Tempra when it comes to fever. What's the main difference? I haven't tried Calpol with fever. Usually used Tempra. Last week, I remember full pack ang rooms for kids sa isang hospital in Dumaguete. All dengue cases. Scary! There's dengue vaccine availabld already here so I think it could help. My boys take Calpol if their fever is high. We have a good stock of it at home as my kind pedia would always give us a few of her samples. I also feel a little at peace when we have Calpol as I need not buy one should we need it anytime. We really need to be extra careful to prevent Dengue. Well, a least we knew the symptoms and what to do. Anyway, I haven't tried Calpol for my kids. Is it better than the Biogesic? I'm so paranoid about Dengue that I've tried almost all mosquito repellents out there in the market. Thank you for sharing! I am a Calpol user! I also am very paranoid when it comes to causes of Dengue. Protection is always needed. Ay super paranoid talaga ako sa Dengue. I'm so grateful that in our humble area, walang lamok! We can even leave the front door wide open andthere's not mosquito. Yun nga lang, maraming bubuyog, haha. Good to know there are allies against dengue and that information is shared to different communities. We really need this since sooner or later rainy season is here again. Thank you for sharing. I haven't tried calpol, will be checking out on this dengue ally for added protection. Thanks for sharing! Btw, I love the pic header. It's been a while since I last visited. Informative post. Thank you for the reminders buti nalang we live in a condo na hindi malamok but I should always be on guard for signs and symptoms of dengue. Parang twice palang nagka fever ang daughter ko (since birth), we will try Calpol but I hope we won't have to hehe! I think she has low pain tolerance and whiny when she's sick, those few times na nagkasakit siya very stressful for me. Too bad I had to pass attending this event. But luckily they still sent me info about it. There's so much about dengue that I didn't know pala. Campaigns like this are really very helpful. I've experienced dengue scare last year and it's truly traumatizing! I lost 4 kilos and had the lousiest 2 weeks of my life. Thanks for sharing this info. Dengue is dangerous, specially when the platelet keeps going down. I had dengue when I was in HS, it was me and my brother, actually. We were both admitted in the hospital. I'm glad my platelet was not as low as the others. 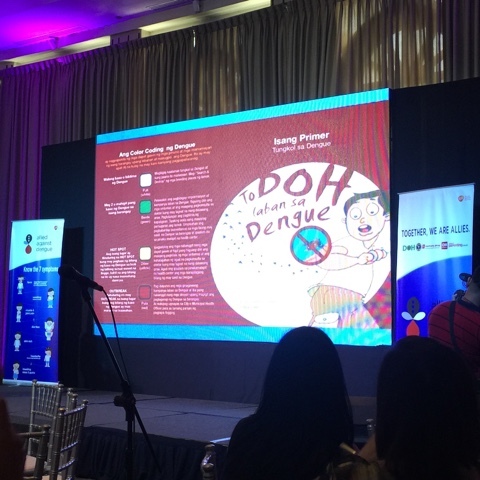 It's great to be empowered with knowledge about Dengue because its such a scary illness. I'm an allied dengue mom and I will do my best to prevent my son from getting dengue. It's allied against dengue mom not allied dengue mom. Sorry for typo. Campaigns against dengue is really helpful, I think even kids should be taught how to defend themselves against mosquitoes.